Atlas of Illinois Counties of Cook, Du Page, Kane Kendall and Will. This is a scarce hand colored map of the counties of Cook, Du Page, Kane, Kendall and Will of the state of Illinois issued by Warner and Beers. Depicts the counties in the northern part of the state of Illinois in great detail, noting towns, finished and projected railroads, public roads, post offices and other topography. The city of Chicago is also depicted. This map was published as plate no. 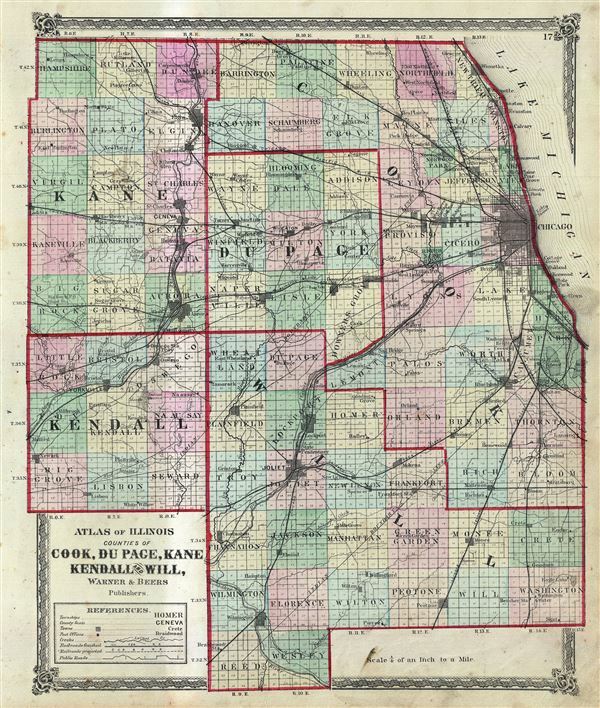 17 in Warner and Beers Atlas of Whiteside Co. and the State of Illinois. Warner and Beers, Atlas of Whiteside Co. and the State of Illinois, Chicago, 1872. Very good. Overall age toning. Minor spotting here and there. Minor discoloration across map left of center. Rumsey 2585.046. Phillips (Atlases) 1576.